"Midwestern threshermen and steam engine fans made Pontiac their rendezvous as they converged on Chautauqua Park this morning to attend Dan S. Zehr's first Steam Engine and Threshermen's Reunion." That was the lead paragraph in Les Bell's front page story in the Pontiac Daily Leader on September 14, 1949. 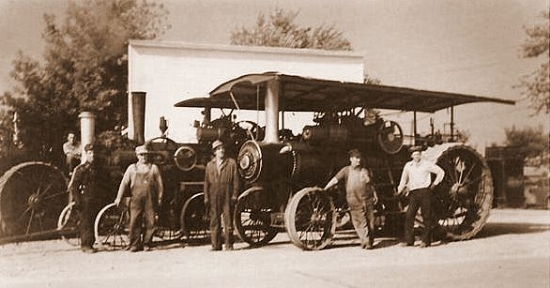 The reunion was the result of a dream and work of Mr. Zehr, who wanted to acquaint a younger generation with the romance of the old steam threshing days and give old timers a chance to reminisce. He hoped it would become an annual affair. Dan was an implement dealer in Pontiac. For the last 12 years of his life he served as superintendent of machinery at the Illinois State Fair. In fact, he died at age 71 after he became ill as he was returning home from fulling his duties at the fair. Mr. Zehr's civic service included three terms as a trustee of the Methodist Hopital in Peoria. And one of his hobbies was playing the mellophone in the Pontiac Municipal Band. Dan Zehr, sitting right, with Slim Slate, Larry Gray and Sy Fosdick at the first Threshermen's Show in 1949. For the first two years of its existence‚ the Reunion was held at Pontiac’s Chautauqua Park. In its third year it was moved to 4-H Park‚ which offered much more room for the many pieces of old equipment displayed and for the many activities carried as the event grew. 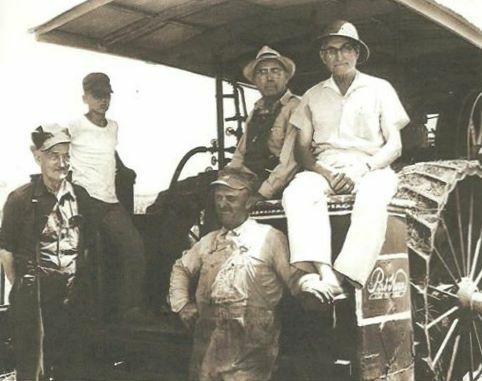 Dan Zehr’s Threshermen’s Reunion has sparked interest in old-time threshing methods and has been copied in a number of places in the Midwest.